Berkshire Forest is an active adult community in Myrtle Beach, South Carolina. Homeowners at Berkshire Forest will have access to classic amenities and live an active lifestyle within their community. Active adult homebuyers will have plenty of options when it comes to floor plans as trusted homebuilder Pulte Homes offer 20 distinct home models. Active adult homebuyers looking for a master-planned community near Myrtle Beach in South Carolina will find a lot to like about Berkshire Forest. Homeowners at Berkshire Forest will have access to the community's resident's club complete with a fitness center and multipurpose rooms. Outdoors, residents will have access to the outdoor pool & patio, spa, as well as bocce, tennis, and basketball courts. Homeowners can also go for a walk or run on the neighborhood's walking & biking trails. A homeowners association covers general maintenance of the community grounds as well as all amenities in the community. Pulte Homes began construction in 2004 and plan to build 1,500 single-family homes upon completion. Pulte offers 20 unique and thoughtfully designed floor plans, giving homebuyers plenty of options. Homes range from 1,656 to 3,200 square feet. Homes have two to six bedrooms and two to five bedrooms. All homes will have a two or three car garage. Homeowners will enjoy features such as bonus rooms, loft spaces, spacious yards, walk-in closets, and patios. Home models come in both one-story and two-story floor plans. 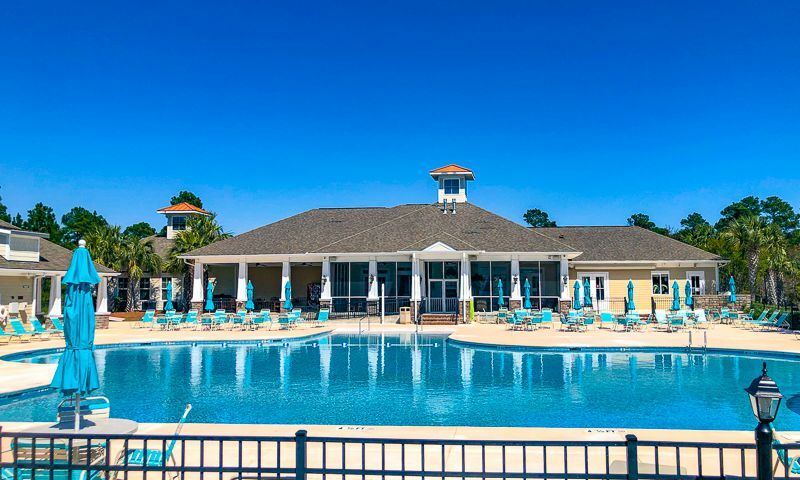 Berkshire Forest is located in Myrtle Beach, South Carolina providing residents with easy access to everyday necessities as well as fun opportunities. Residents of Berkshire Forest will never be far from daily conveniences as there is a Kroger, Food Lion, Publix, CVS, Walgreens, and Village Square Shopping Center all within 15 minutes of the community. When dining out, restaurants such as Mellow Mushroom, Sol y Luna, Joe's Crabshack, The Grumpy Monk, and Brother Shuckers Fish House can be found nearby. When looking for entertainment options nearby, residents will find The Big "M" Casino or Cinemark at Myrtle Beach close by. Homeowners hoping to explore nearby outdoor spaces will be in luck. Golfers will be happy to know that there are several courses in the area including River Oaks Golf Plantation, World Tour Golf Links, Kings North Golf Course, and Witch Golf Links. There are also several parks and greenspaces nearby such as Grande Dunes and Waccamaw National Wildlife Refuge. Residents at Berkshire Forest are also less than ten miles from the beach. Berkshire Forest is also close to several nearby healthcare providers such as Little River Medical Center, Carolina Forest Senior Health, and Grand Strand Medical Center. Residents looking to live in a beachside community will be in luck as they will be surrounded by the popular city of Myrtle Beach on all sides. When it comes to long-distance travel, Myrtle Beach International Airport is only 14 minutes away from the community. Check back soon for more information on the lifestyle in Berkshire Forest. Cambridge Series model homes include three to five bedrooms, two to four bathrooms, and two-car garages. Some floorplans include second floors, upstairs lofts, and downstairs flex spaces. Prescott Series single-level homes include two to five bedrooms, two to four bathrooms, and two-car garages. Sutton Place series home range from two to five bedrooms, two to five bathrooms, and two- to three-car garages. Options include a cook’s kitchen with corner pantry, upstairs lofts, and private suites for overnight guests. 55places.com is not affiliated with the developer(s) or homeowners association of Berkshire Forest. The information you submit is distributed to a 55places.com Partner Agent, who is a licensed real estate agent. The information regarding Berkshire Forest has not been verified or approved by the developer or homeowners association. Please verify all information prior to purchasing. 55places.com is not responsible for any errors regarding the information displayed on this website.